Suitable for indoor or outdoor use, the AIVIA 200 cabinet is open access and protected by security seals. Robust and lightweight, the AED enclosure is made of 2 distinct parts : a polycarbonate shockproof cover and a red ABS frame. These materials are well known in the industry, giving excellent shock resistance properties. Open access to the AED is protected by security seals. A regulated heating and a fanning system enable the AED unit to be stored in ambient temperatures. The system is activated through a temperature sensor according to configured thresholds. The heating protection is effective down to -4°F. 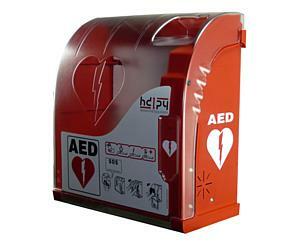 AIVIA 200 is equipped with an audible alarm (103 dB), which alerts when the AED is taken off. This alarm is combined with flashing red LED lights give a visual warning. These red lights can also alert bystanders to the fact the ambient temperature has reached preset thresholds. A night and day lighting system, with a luminosity detector, is automatically triggered in low ambient light. White flashing LED lights help identify the location of the AIVIA when dark. The AIVIA 200 cabinet is powered with 24 V DC 75 W (Safety Extra Low Voltage) which allows the operation of the heating and fan systems. With this specificity as well as its intelligent design, the AIVIA® 200 is suitable for outdoor positioning, in public and private sites.